Despite the popular perception that Google is a search engine, reality is that Google, through its AdWords ad serving platform, is one of the world’s largest advertising networks. The vast majority of the Internet’s giant does in fact come from advertising. In 2018, Google’s AdWords worldwide revenue was a whopping US $ 116.3 billion out of a $ 136.2 billion total revenue! How can this platform be so successful and bring in so much revenue for Google? The simple answer is that it works. For many companies wishing to promote products and services, advertising on Google is a value for money way of presenting their offers to ready to buy customers. Companies in Cyprus can of course use this advertising channel to reach their marketing goals economically. Google AdWords offers two ways to communicate an eMarketing message to your targeted audience. The first is through its search engine where text ads relevant to queries being made on it are served to a user and utilizes the Pay Per Click (PPC) model. If done correctly this is a high impact method of delivering advertising to a person looking for more information or ready to buy what you offer. 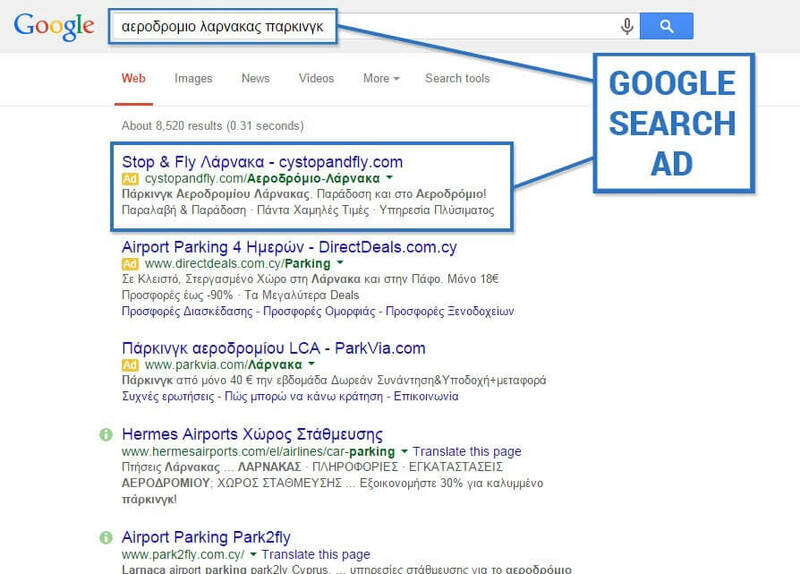 For example if a user searches for “αεροδρόμιο Λάρνακας πάρκινγκ” on Google it is possible to serve an ad for a provider of such services. Ads can be geographically targeted only to Cyprus down to the district or city level, i.e. Nicosia, Limassol, Larnaca etc, if desired. Google AdWords for search also offers a dazzling array of other targeting options. These include age and gender segmentation, targeting according and even retargeting past website visitors. The GDN is an excellent tool to create awareness for your products or services. Google AdWords serves ads through a huge number of associate web sites and other online properties called the Display Network with a choice of utilizing either PPC or Cost Per Thousand impressions (CPM). These web sites present to their users text and image ads through a sophisticated selection process. 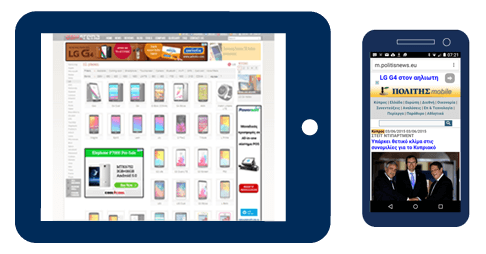 An advertiser may opt to show banner ads in specific web sites popular with an audience of interest, choose to show ads across the network wherever relevant content is present or target ads to people that have visited specific pages on the advertiser’s web site. Below you can see screenshot examples of Google AdWords appearing online. Delivering advertising through Google’s Display Network is a cost effective way of enhancing branding and introducing new products and services to Cyprus, or even higher defined geolocations. It is possible to confine ads to districts such as Nicosia, Limassol or even go to finer levels such as Strovolos. If you feel that you need help in reaching customers that are looking for your products or services by advertising on Google or its Display Network, reach out to us. Contact us by phone at 70002665 or email us and we will be happy to assist you. Do you have questions on how our Google AdWords management services can be of help to you? We will be happy to discuss your needs with you! Contact us at [email protected], call us at 70002665 or visit our offices in Nicosia for a consultation on how our Google AdWords and PPC services can fit your organization’s needs and help you achieve your goals.